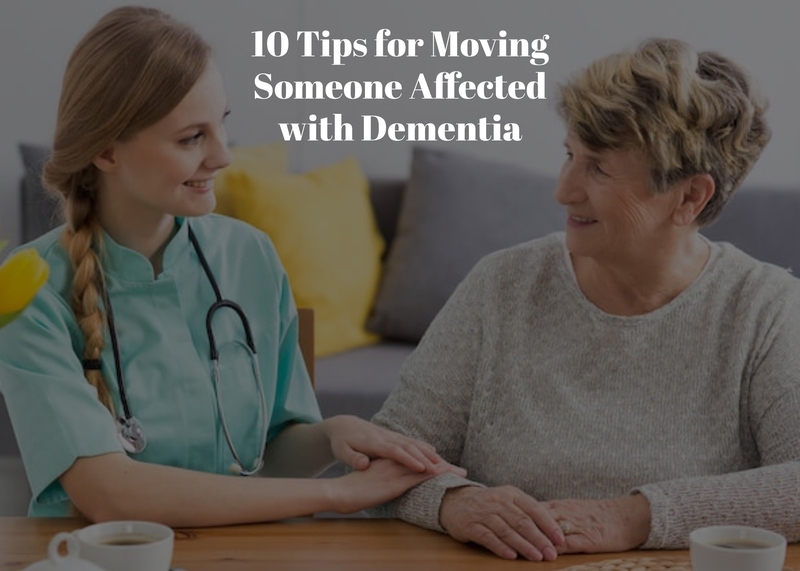 If your loved one with dementia is moving from home into a senior living community, the following tips will help you to make the move successful! Involve your elder as much as is reasonable and comfortable for them in the plans for the move. While your elder might not be in a position to choose their own community, they can probably make choices about what they take with them. Be sure to have open communication about the moving process and give your elder as much independence in the transition as you can. This will give your loved one a sense of control and comfort. Be prepared for emotions. For seniors with dementia moving is scary. If your elder does express fear or anger at the move, validate their feelings. Do not argue or disagree. But do acknowledge that the move is for their wellbeing and safety. Move during the mid-morning or mid-afternoon. Early mornings tend to be a busy, hectic time at communities. A calm entrance will be less alarming to an elder with dementia. When planning to move a loved one to a community, set the stage first. Arrange the room with familiar items before they arrive. Familiarity will assist with the adjustment. Allow for some quiet adjustment time for your elder in their new room before venturing out to other areas of the community. Keep in mind that new places can be intimidating to seniors with dementia. So take it slowly with touring and “getting to know” the new community. Don’t try to tour the whole place in one day! Perhaps start by showing your loved one just the dinning room and activities areas. Along the way, point out landmarks to help them remember. Take it one day at a time. Ask staff at the facility to limit the number of people coming in and out of the room or introducing themselves. Pick one person, perhaps the Activity Director, who will be the contact person for the first week. Communicate verbally and in writing that you want contact limited. Or if your elder has been receiving home care, have the scheduled caregiver continue to visit at the new community for the first week or two. This can be very comforting to the elder, but also beneficial to the staff, who can learn about how to best care for the senior from someone who is already familiar with his or her care needs. Join you elder for meals during the first couple of days. Choose a quiet area in the dining room. The noisy, busy bustle of the dining room can be upsetting and agitating. Limit introductions to new people for the first couple of days, but then after the senior settles in, encourage it. Keep a happy face, even though you may not feel like it. Your loved one might be living with dementia, but he or she can still read your emotions and feel your energy. If you are upset it will upset your loved one. If you are panicked, it will alarm your loved one. So keep smiling and keep yourself calm to help reassure your elder that this is a positive transition and they are safe. 8:30 – Normal time he/she gets up. Takes pills at this time with orange juice. 10. Be Patient. Patience is key during this process. Be patient with your elder, yourself, and the new community. It will take at least 4-6 weeks to smooth out many of the wrinkles you encounter in the first week following move-in. It takes time for the community to establish an ideal care plan for your elder and for your elder to adjust to their new surroundings. It is important as time goes by, to facilitate this adjustment, to allow your elder some space to make connections to his or her new community members. Keep in mind; if you visit every day, you might be taking opportunities away from your elder to participate in the community! At Wiser Home Care Services we understand the challenges of caring for a loved one with dementia. Our caregivers receive special training to care for seniors with these needs. We are dedicated to providing high-quality care and we can offer support to families during this difficult time. Wiser Home Care develops a plan of care tailored to the needs of each client. I agree that setting the stage and preparing a loved one with dementia for a move into a nursing community would be really important. I would imagine that taking the time to ease your loved one into this type of situation would really help them emotionally. My mom has some pretty severe dementia, so when we go to move her into a community we’ll have to be sure to ease her into it. Olivia, We are so glad to hear that our blog has you thinking about the best way to ease your mom into an ideal living situation. Dementia is difficult for everyone involved, but with patience and planning it is easier. We wish you the best, let us know if we can be of any further help.